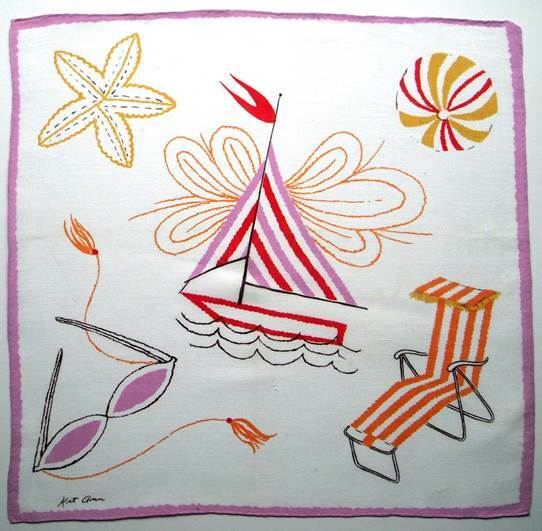 Could there be a better hankie to declare “It’s Summer?” The clever use of crisp stripes, repeated in angles, curves and parallel ribbons on the sailboat, beach ball and chaise lounge feel fresh, flirty and fabulous. Check out the cat eye 1950’s shades (see 50 Shades) with their flirty fashion tassels, as well as the the oh-so-hip graphic employed to depict the wind behind the sails. Terrific. Even the starfish bends and dips to do a little dance. 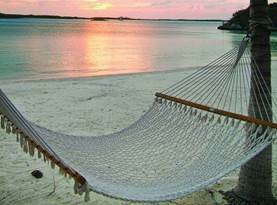 The candy pink border underscores the lighthearted impression that indeed, Life’s A Beach! These bright and colorful minimalist scenes perfectly depict how we want to feel ocean side. Free from care with nothing more than a towel for napping and some specs for shade. 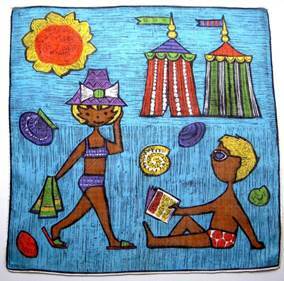 The darling image on the left with gaily stripped cabanas and blazing sun, sports a gal in a 1960’s sunhat reminiscent of a happy-go-lucky Doris Day. Speaking of happy, note the ear to ear grin on the guy to the right. He can’t believe his good fortune, landing in the sunbathing spot of his dreams. Afraid to close his eyes, for fear it’s only a dream, I doubt he’ll budge an inch, even if he burns to a crisp. 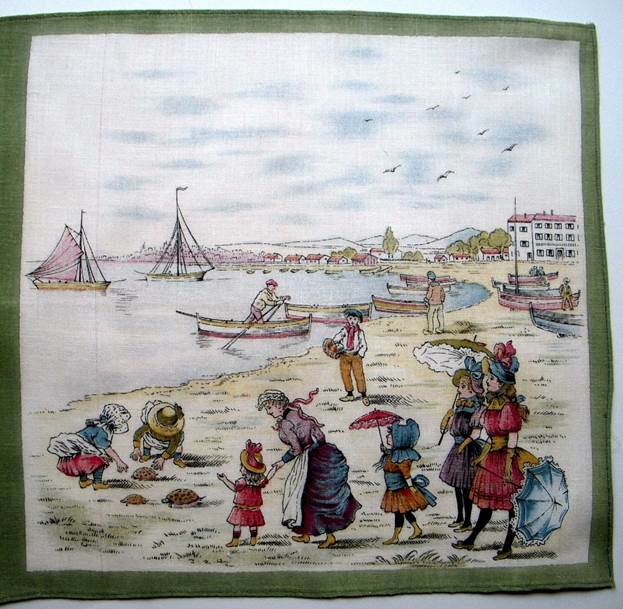 In complete contrast to our modern sunbathers is this highly detailed Victorian scene, where children stroll in full ensemble, complete with parasols and sunbonnets. (We somehow lost sight of the sun’s power in the baby-oil-and-aluminum foil-era when we broiled our bodies like chickens on a grill.) The vigilant nanny supervises a gaggle of girls, while one adventuresome pair (note the raspberry bloomers) swarm around a newly hatched nest of baby sea turtles. Lulled into lethargy, when we awaken from our seaside snooze, we comb the beaches seeking treasures, in this case, wonderful fans of coral and swirling whelks. 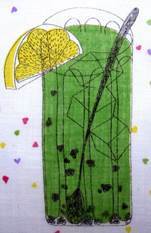 This design would be divine printed on the finest linen slipcovers or billowing curtains, whether in Palm Beach, the Seychelles, Fiji, Bora Bora or Maldives. 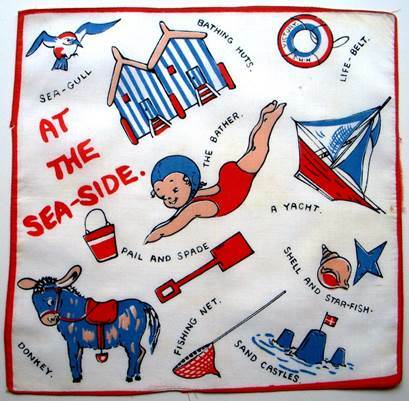 Simply slip this hankie in your pocket for a quick reminder of that balmy bungalow by the bay. 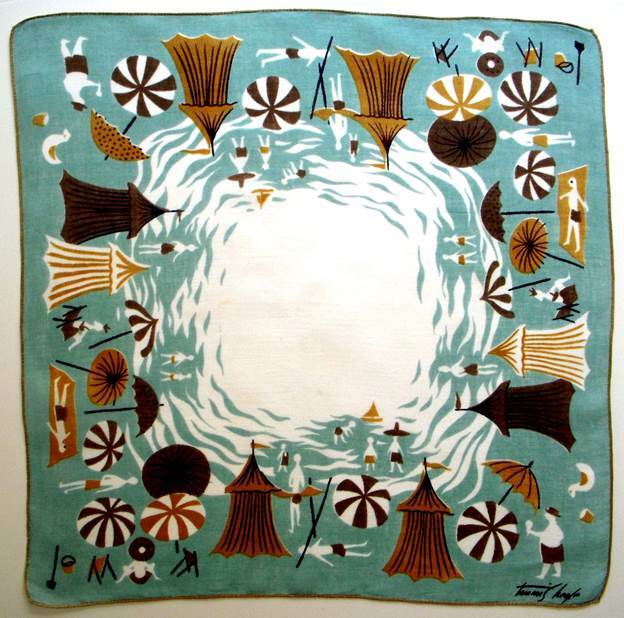 This may be only a hankie, but it showcases first class design. 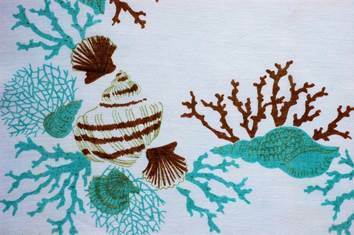 Artist Tammis Keefe captures the essence of seaside treasures one hopes to find washed ashore after a winter storm. Often replicated in multiple color schemes, this first version floats on a whisper soft turquoise backdrop. 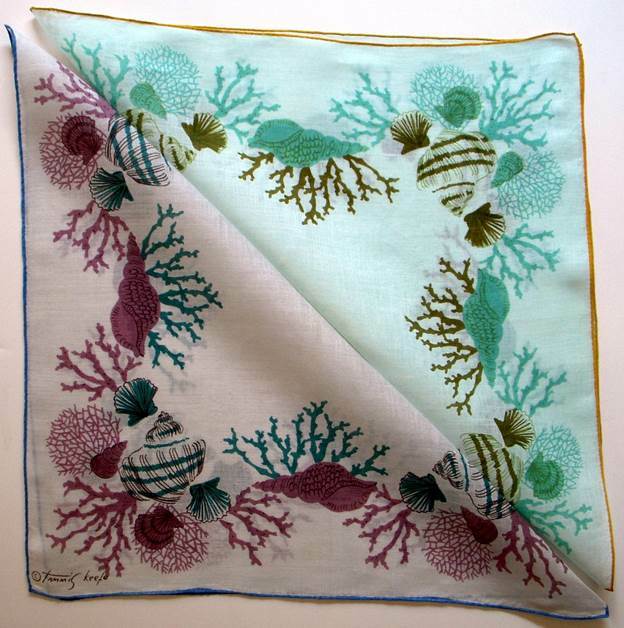 The second version in rich mauve and deep turquoise set against stark white, perfectly depict how an underwater image transforms when washed ashore to bake in the sun. 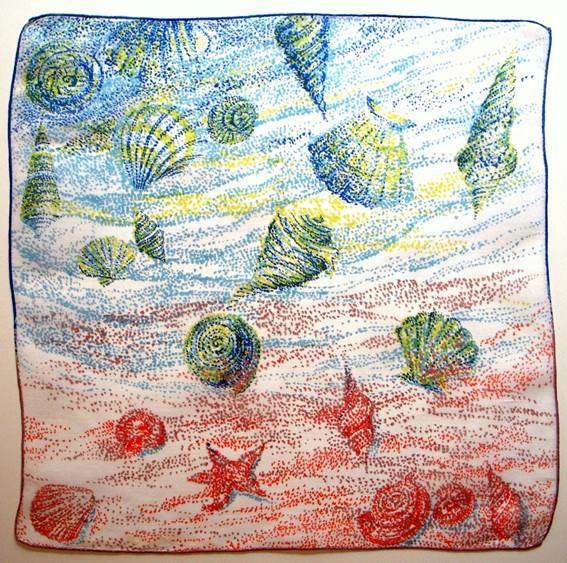 A second artist’s depiction of shells seen both underwater and washed ashore is rendered in a Seurat pointillist style imparting an image sand and swirling water. 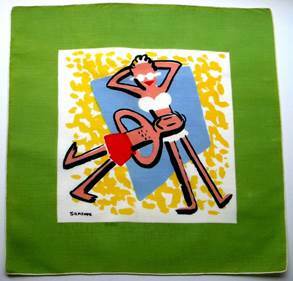 It’s easy to see how this is truly a mini-canvas for the artist’s creativity, and so much more than a simple hankie. We revisit artist Keefe as she employs the turquoise and tan palette of a tropical paradise to convey a feeling of summer escape. 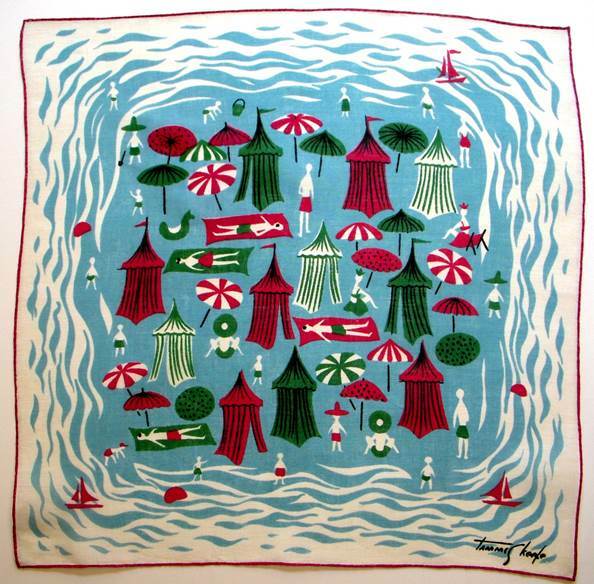 Umbrellas and cabanas form a fanciful border around a swirling, shimmering sea. With a minimum of strokes, she deftly illustrates the spectrum of tourists – from the portly bather slurping his ice cream, to children with their sailboats, to exhausted executives napping like beached whales on comfy terry towels. The beach is crowded, but the expanse of cool water dead center brings relief. It’s an oasis of sparkling respite left untouched. Meditating on nature’s calm amidst the frenzy, we’re confident we can carve out a tiny sanctuary of serenity for ourselves. 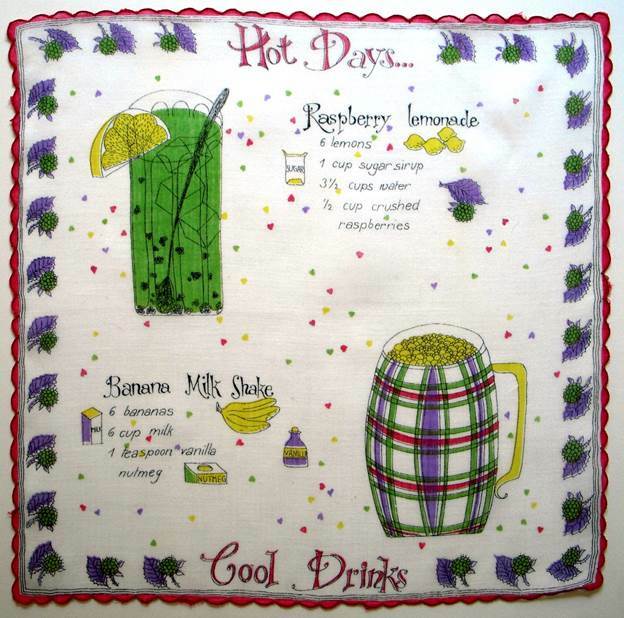 I love everything about the hankie above – the colors, the images, the overall layout. I found it interesting that when the artist arranged the same subject matter in another configuration, I had a completely different visceral response. 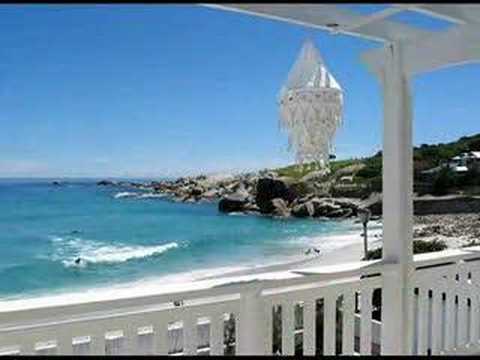 Logic would seem to dictate a calming border of water surrounding our bathers would impart a feeling of tranquility. 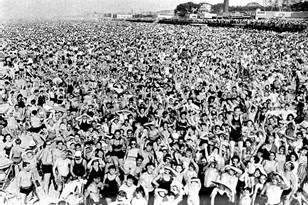 Instead, the centralized mass of humanity feels like an overpopulated island of tourists with no means of escape. Not my idea of fun at the beach Yes please! I have never seen anyone invest more time, energy, and creativity in a blog. This is a true treat every time an issue arrives.